#DonovanMitchell | Bring Your "A" Game Sports Talk! 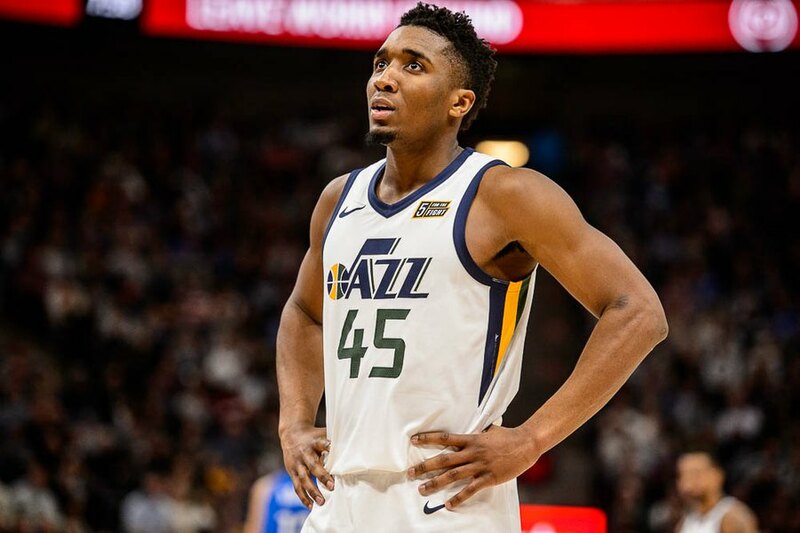 Utah Jazz Superstar guard Donovan Mitchell may not take home a Rookie of the Year award if the virtual coin toss favors Ben Simmons, but at least he’s being mentioned in the same sentence as Michael Jordan. According to ESPN Stats & Info, Mitchell joins Jordan as the only rookies ever to score at least 53 points in their first two career playoff games. The previous record holder is someone you may have heard of. Even sweeter for Mitchell is the fact that he now holds the most points ever among rookies in their first two postseason games, as he had 55 total markers in that span. After having a 27-point output in Game 1 in a 116-108 loss to the OKC Thunder last Sunday, Mitchell added 28 points more in Game 2 on 10-for-25 shooting from the floor to lead the Jazz to a 102-95 win. If there’s anything that’s not falling for Mitchell this postseason, it’s definitely his 3-point shot. As good as Mitchell has been in finding the bottom of the net in this series, he just could not get his stroke from deep. He shot 0-for-7 from downtown in Game 2 and is now 3-for-17 on his 3-point attempts thus far in the first round. Nevertheless, expect the Jazz to ride on the hot hands of Mitchell, as they travel back home for Game 3. The Jazz have won all of their last four home games dating back to regular season. The Utah Jazz got off to a rocky start in their playoff campaign this year, losing to the Oklahoma City Thunder on Sunday in Game 1 of the two teams’ first-round encounter, 116-108. What was especially frustrating for the Jazz is that they were not able to have a 100-percent healthy Donovan Mitchell for an entire game. Mitchell hurt his toe in the second half that forced him to leave the contest temporarily because of left foot soreness. He would later get re-inserted into the game, but his presence was not enough to help Utah overcome Paul George and the Thunder. In a bit of good news for the Jazz, Chris Haynes of ESPN has reported that the MRI on Mitchell’s left foot showed no serious damage.